The Accidental Mardi Gras - Laissez les bons temps rouler! 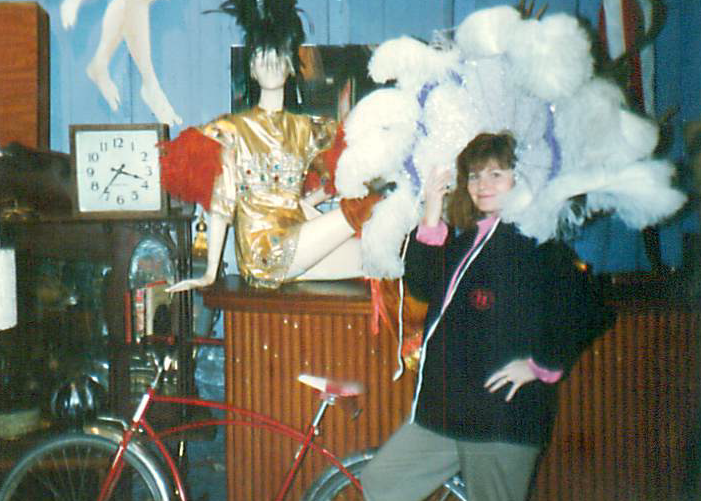 Have you ever Accidentally been to Mardi Gras in New Orleans? I highly recommend it. Setting: early 90's St. Louis Missouri. My girlfriend and I realize that both of our husbands are going to be away working for a long weekend so we decide it is the perfect time to hop in the car and go see New Orleans. So, as quickly as it took for you to read this, we had the car packed up and Cynthia, Matt (my soon to be one year old) and I were off. Did I mention that Cynthia was also seven months pregnant? The plan was to hop in the car drive down, spend a day in New Orleans and then drive home. RoadTrip: The drive from St. Louis to New Orleans is beautiful. Our first stop was in Sikeston Missouri at Lambert's Cafe - Home of the Throwed Rolls. We weren't sure about this place but there were four cop cars in the parking lot so we figured that the place was either really scary or the food was really good. It turns out that the food was really really good and the prices were amazing. Even though the place was packed and we didn't know anyone in the room it felt like one big family reunion. If you are within 500 miles of Lambert's Cafe it is worth a stop. We continued driving but since this was pre-google maps days we realized that it was going to take us about 11 hours to get to New Orleans and maybe even longer if we kept making stops like the one in Sikeston. So, we stopped along the way and decided to get an early start in the morning. Day Two: We did get an early start and found ourselves driving over the long bridge into New Orleans and into downtown well before lunch. As we were checking into the hotel I asked "What's all the commotion?" The clerk politely responded, "It's Mardi Gras". They must have had a great laugh after we left though. A pregnant lady and a woman with a one year old checking into a hotel in New Orleans and not realizing that it was smack dab in the middle of Mardi Gras! What were we thinking? But again, we were a little naive because it was only 11:00am in the morning still so certainly the festivities would not be too wild yet. As we made our way to Cafe Du Monde for some espresso and beignets we realized we were wrong. The place was buzzing! Jazz music could be heard wherever we went, the food was out of this world, and the crowds were lively. We sat in Jackson square while we ate our beignets and just enjoyed the sites and sounds of the city. Then, once we were sufficiently covered in powdered sugar, we got up and walked up to Bourbon street. The street was packed and it appeared as though the party had started early that day (or was just still continuing from the previous night). It is hard to tell from this picture of my friend Cynthia, but under that very conservative blue sweatshirt she really was incredibly pregnant. There was no missing it in person. Matt, who was strapped to me, was loving every minute. As we worked our way through the crowd we heard a loud "CINDY!" and a large group of very large ( and possibly quite intoxicated ) men started making their way toward us. Her husband was working all weekend long but, apparently, the Lacrosse team from St. Louis that he usually played with on weekends, was not. They all stopped and talked with us for about two or three minutes and then they must have realized that this conversation was seriously cutting into their Hurricane drinking time. So, they took off but it did provide a lot of laughs and added to the surreal experience of accidentally finding ourselves in the middle of Mardi Gras on an innocent girl friends weekend away to New Orleans. Postscript: We had an amazing time in New Orleans on that trip. We didn't stay out late and we did get an early start back up to St. Louis and made that trip in one day. 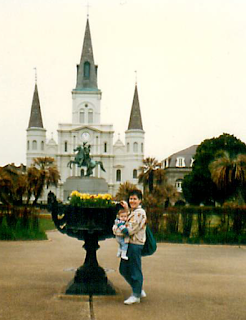 I have been back to New Orleans since then and love visiting. It is a great town that definitely knows how to entertain guests. But ever since that trip I do try and look in advance to find out if there are any special events happening before I leave home. Do you have great memories of Mardi Gras? Share them with the #TMOM team on Twitter Monday night at 9pm EST. CLICK HERE for more details about the TravelingMom.com Mardi Gras Twitter Party. Isn't New Orleans amazing? especially during Mardi gras!! been there couple of times and i just love it.